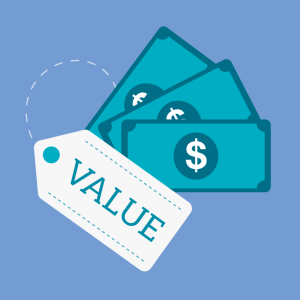 A well thought-out pricing strategy is crucial to optimizing both sales volume and profit. It is somewhat surprising therefore, that only one in ten of all business-to-business companies has a formal pricing strategy in place. Every company needs to ask itself the question “am I charging optimum prices that will generate the maximum profits for my sales?”. The consulting group McKinsey carried out a famous study that determined a price rise of 1% at an average company in the S&P 1500 index (which covers small through to large companies) would generate an 8% increase in operating profit if sales volume stay steady. With just a 1% price increase, sales are unlikely to waver much and the extra profit flows directly onto the bottom line. The leverage of price is substantial. All overhead costs have been met and so the additional gross margin that is obtained (somewhere between 40% and 60% depending on the product or service) contributes completely to net profits. It does of course raise the question “why not increase prices by 5%, 10% or even 15%?”. The manipulation of price upwards (or downwards) offers potential for increased profits. In order to make the right move and at the right amount, it is important to know the affect this will have on sales. If for example, a small reduction in the price of a product results in a disproportionately high increase in sales, a price reduction may be worthwhile. In this case, the elasticity of demand for the product is high as sales expand disproportionately to price cuts. Consumers are strongly motivated by small differences in price in petrol and diesel and will form queues to save a few pence per litre. This is on a micro level where fuel stations with different prices are within a short distance of each other. Still thinking of fuel prices, the demand for fuel in general is highly inelastic in that we will pay almost any price for the valuable fuel we need in our tanks as long as all fuel service stations charge the same figure. Goods that are elastic are those that are easily substitutable one for another. So too are products that have very few differentiating features. The opposite of this is also true. Goods that are written into specifications and cannot easily be changed are likely to be inelastic and a price increase will have very little effect on demand (at least in the short term). Products that are differentiated with lots of special features or with a strong brand are likely to be inelastic because people will insist upon them irrespective of a (reasonable) price increase. Price is one of the important means by which customers compare products and services with those of the competition. Take a group of suppliers that sit within a customer’s consideration set; some may be supported by strong branding, premium services, guarantees and the like and as such carry a substantial premium. Others could offer low-cost products, stripped of any wrap-around services. Customers recognize the difference in these offers and the value for money they represent. An expensive product with lots of features may be considered to offer fair value for money just as much as one that is cheaper but with fewer frills. In an economist’s perfect world, all these products would gravitate towards a point on the value equivalence line that cuts diagonally at 45 degrees from where the X and Y coordinates meet. However, suppliers do not always fit neatly on the line. Some are perceived to be expensive with few benefits, in which case they sit to the left hand side of the line and can be predicted to lose market share, while others may be considered economically priced with a large number of benefits and so can be expected to win market share. These suppliers sit on the right hand side of the line. Knowing where a company sits on the value equivalence line is an important requirement of developing a marketing strategy. A company positioned on the right hand side of the value equivalence line has the option of leaving the price and benefits as they are and enjoying a growth in market share or raising prices and capturing more profit. 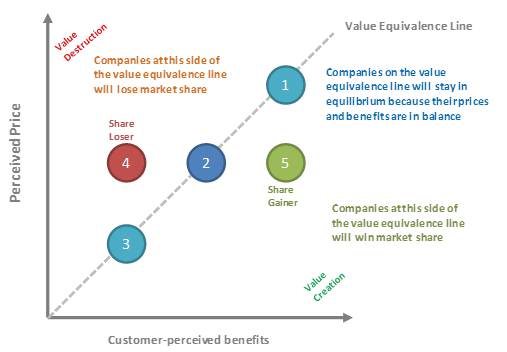 Similarly, a company to the left-hand side of the value equivalence line knows that it must offer more benefits if it is to succeed or it must reduce its price if it wishes to compete. It could, of course, stay where it is if the plan is to milk the product and eventually exit from the market.